We imagine silk rustles, babblings and downed laughter, one thousand one delicate and tender delicacies, bouquets of languid roses distilling their pleasant perfume. ROSE PRALINE is the perfume of these intimate and feminine afternoons, when everything is only coquetry and insouciance. Rose Praline was developed by perfumer François Robert. The fragrance notes for the gourmand floral include cardamom, bergamot, rose, geranium, chocolate, lapsang souchong tea, amber, sandalwood, cacao and white musk. 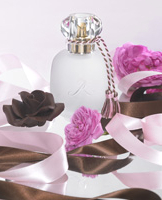 Other recent launches from Rosine: Zephir de Rose, Rose d'Ete Eau Fraiche. Immerse yourself in the sensuality of exotic celestial maracuja: heady tuberose, lush gardenia, sensual jasmine, and amber gris…. 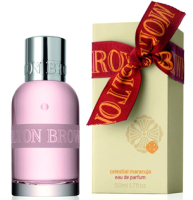 Molton Brown Celestial Maracuja is available in 50 ml Eau de Parfum, $70. (via moltonbrown). God that makes me hungry! And I really don't need to be hungrier than I already am, lol! I haven't — I've fallen terribly behind on the Rosines! HA — yes, it made me what a chocolate bar w/ rose petals. Someone must make one, but don't know who. I've got the info on Rose chocolate if anyone's interested….. I am! Please divulge the info! Cadbury makes a “Turkish” candy bar that is filled with rose turkish-delight-type goo. One of my faves. I find them at Cost Plus. J, surprised not a single store in NY carries them all — thought Barneys used to? Or was it always just a fraction of the line? Robin, They still have part of the line at Barneys on Madison Ave, but not all the recent ones (no Diabolo or Zephir). They've also dropped some of the older ones (no Poussiere, Ecume, or Twill). They do have the new Eau Fraiche, which seems a bit redundant to me. Hi, I'd be happy to share, but not sure if it's allowed/appropriate on the blog? Shoot me an email. That's too bad. But the line has admittedly gotten LARGE. I'd like opaque too! But they'd probably cost more. The Rose Praline is full of my favorite things. I've got to try it!!! I haven't tried any Molton Brown's yet, but I am really interested in the Rose Praline. The notes sound great! Oh dear, Tama, I am in trouble now, there is a Cost Plus on my way home from taking kids to school every day. I already stopped in to check out the candy collection. I so enjoy receiving little candy treats in some of my perfume buys. Now I need to go back and peruse the chocolate aisle. Chocolate and rose goo, YUM! The Molton brown sounds lovely, except of the cardamom and a bottom note of patchouli. It's fine if done lightly. Is it so heavy that he flowers have been drowned? I am a woody froral girl or a light oriental? Darn it! I mixed them up! the rose one has cardamom and no patchouli. I should never post while half asleep? I apologise. Hope someone help. Can I just say that rose praline sounds great? Lapsang Souchang tea, chocolate, cardamom, cacao… and rose! I like the way it sounds and I hope I'll be able to sample it soon. Of course you can post it here, why not? The tea & cardamom sound lovely. The rest of it — I'll wait to see how sweet it is! -Dagoba, try the chiles & dark chocolate, or the raspberry & rose dark chocolate.